Juan Moreno is a 33-year-old single father of 4-year-old Chico. He meets with social worker Clara Soto because recently Chico bit another child at Head Start. Chico has other problems at school, including not paying attention to his teachers, disrupting class, and bothering other children by grabbing toys, teasing, and being overly physical. This is the first biting incident, and Chico has not been aggressive in other ways. The first session is a meeting of Mr. Moreno, Clara, Chico’s two classroom teachers, and the teacher’s aide. Clara explains that the purpose of the session is to discuss Chico’s problems and to try to help him change his behaviors in the classroom and with the other children. They believe that the biting was a one-time case of extreme frustration and hope that dealing with Chico’s other problem behaviors will reduce the probability of a repeat of this more serious problem. The teachers provide wildly disparate estimates of the frequencies of these behaviors, so Clara suggests a week of baseline data. She works with the teachers to construct a form to record the above problem behaviors. Graciela, the teacher’s aide, will observe Chico for 30 minutes each day in four different contexts (free play, different directed activities, lunch, and story time). Clara spends some extra time with Graciela operationalizing each of the target behaviors to ensure the reliability and validity of the data. 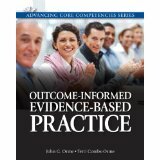 This chapter discusses the use of behavior observation for monitoring client outcomes. We begin with a definition of behavior and a discussion of the purposes of observing it. This is followed by a discussion of the decisions you must make about what dimensions of behavior to measure, and about how, when, and where to measure. We next discuss the practicalities of behavior observation and provide some forms you may use for this purpose. We next discuss the important issue of assuring that your behavior observation data are reliable and valid, and the process of setting behavioral goals and objectives. Finally, we present some advantages and precautions for collecting behavioral data.